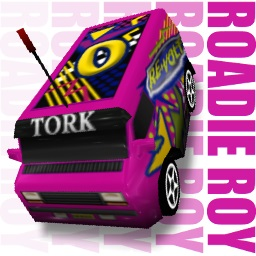 To celebrate my birthday, today I will release 5 cars, and Roadie Roy is one of them. It is a rookie car very competitive for it's class, easy and fun to drive car. It's base is Pest Buster, made by Kiwi, with slightly changes and a few part remapped. Parameters were done by Kipy and I did the pai ts and body. For an extra bonus you have in it's folder a secret Winrar, "a treasure" which can be unlocked by a numeric pbuttword. Hint, my birthday. Thanks Xarc for all 4.carboxes.